The competition is already roaring in Korea, and IEM Katowice will light up our first global tournament by the end of the month. We are pleased to present the complete ruleset for the 2017 World Championship Series. Below, we have summarized some major updates and information that are included in the ruleset. Further details about the GSL vs. the World event will be shared at a later date. 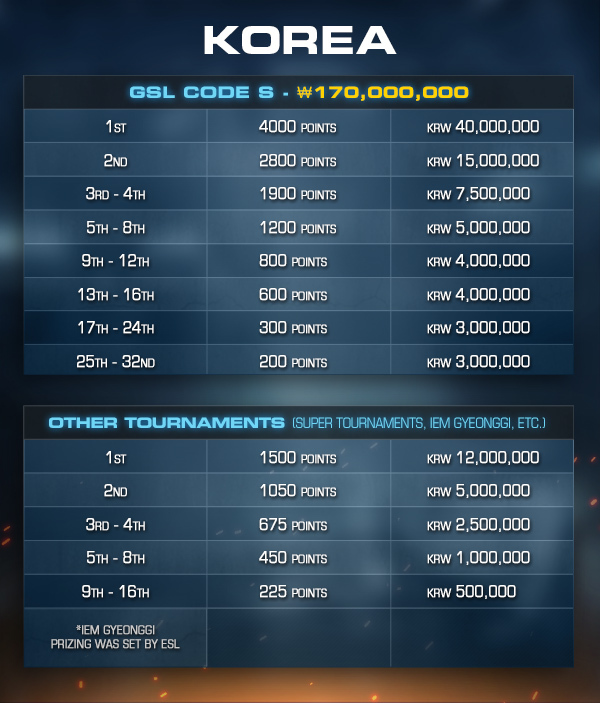 The already earned points from IEM Gyeonggi and GSL Code S Season 1 will be added throughout today. The residency requirements for those wishing to compete outside of their home region have remained largely the same from 2016 to 2017. If you are a player attempting to compete in a region in which you do not have citizenship, please reach out to the Blizzard Esports Team at esportsteam@blizzard.com. 2016 was in the first year Japanese players were eligible to participate in the WCS. While we appreciate their contributions to the ANZ & Southeast Asia region, we’ve examined the player experience and decided that due to server location it makes sense to home Japan in the Taiwan/Hong Kong/Macau region. We hope this will provide a better experience for all players. Finally... Some rules and points awarded! will scarlett play for GSL this time? Well it's earlier than last year's rule book. Nothing too surprising. so, will katowice basically be the last SC2 IEM? Carmac already confirmed IEM XII will have SC2. That's up to Carmac. Carmac has said in a TL interview that he's still passionate about SC2, but who knows what the future holds. That means 4 global events, right? Much nicer than 2016! 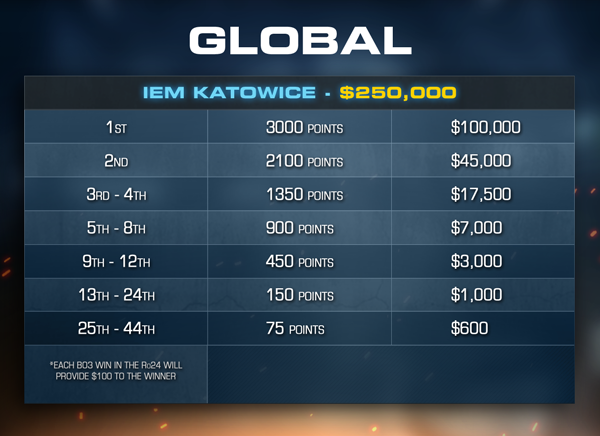 Regarding to the posting only IEM Katowice is Global, isn't it? Overall still a bit disappointed there aren't more WCS and / or Global Events ... it is a step back to the last years. Great to see the ruleset...wouldn't be surprised if SC is dropped from the IEM roster soon. Feelsbergman. IEM Katowice, IEM Gyeonggi, Super Tournament 1, Super Tournament 2 are not region locked, so they are global, right? So players who did well in the last IEM ggyongi had already WCS points? wait , where is DreamHack Open Tours (France) on May 6th to 8th ? 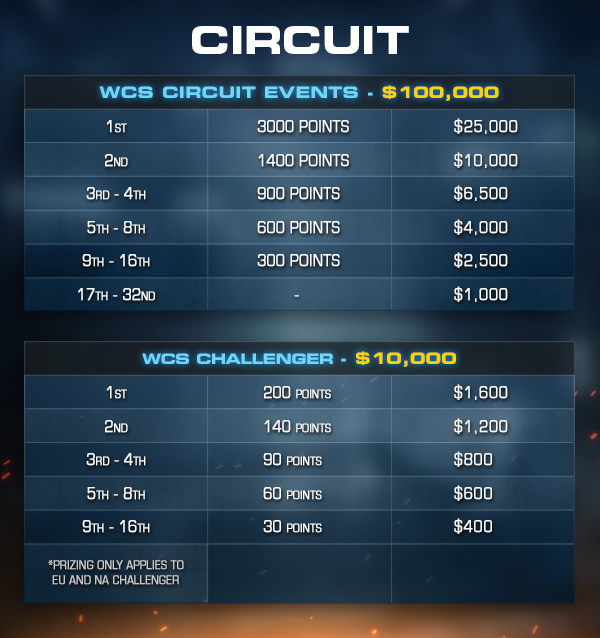 It is not a WCS Circuit tournament anymore ? No point granted ? So I guess there will be no StarCraft at DreamHack Tours ? Super Tournaments and IEM Gyeonggi are WCS Korea, tho I guess if you're foreigner you can compete there anyway but you won't earn points in the WCS Circuit. I don't understand why this took so long tbh. 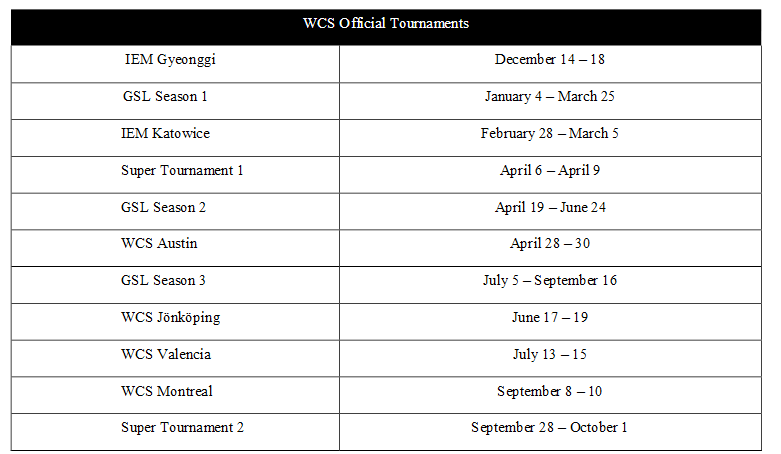 They announced all those tournaments as WCS tournaments in December. It can't be that hard to figure out the point values. So is this the WCS 2016 Korea but for foreigners in 2017? 4 events total really? It was 3 last year but with 3 extra DH, the Gold series, IEM shanghai and wcs copa intercontinental, so 9 events total for wcs points. Are they gonna announce more tournaments or is that it? Even counting global events it's like 70% of last years circuit prize pool.